RANGER-Inkssentials Glue N' Seal. 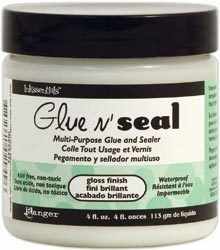 An all-purpose glue and sealer that can be used for decoupage; scrapbooking; card-making; collage; and more. Acid free; non-toxic and archival. This package contains one 4 fluid ounce jar of Glue N' Seal. Available in either Matte or Gloss finish: each sold separately. Conforms to ASTM D4236. Made in USA.